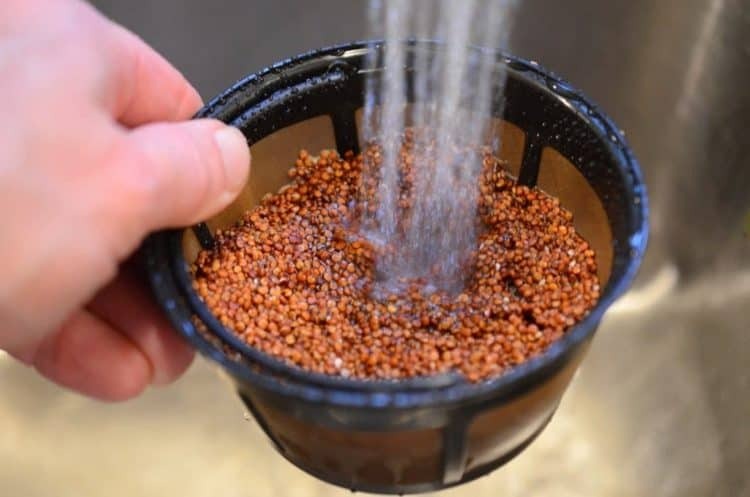 Home » Collections » Kitchen Tips and Hacks » Easy Rinse Method for Quinoa – Food Flash! Easy Rinse Method for Quinoa – Food Flash! If you’ve ever wondered how to rinse quinoa, you’re going to love our Easy Rinse Method for Quinoa! For an Easy Rinse Method for Quinoa, call on your coffee pot! We have a few quinoa recipes here on Platter Talk. Quniona is the ancient power food that is making a resurgence in the 21 century. As you may or may not know, quinoa needs to be rinsed with cold water before cooking it. This simple process will help get rid of the bitter tasting compound (saponin) that coats the tiny seeds; if you don’t do it, it’s going to taste wrong and you’ll never want to use this ancient power food again in your diet. We don’t want that! See our Current Most Popular Recipes Here! Because the quinoa seeds are so tiny, you don’t want them to disappear down your kitchen sink drain when you rise them. Here’s where things get fun: Use a fine-mesh strainer. This basket-style coffee filter stores easily in your kitchen drawers and make for a handy fine-mesh strainer for rinsing quinoa and so much more! Order yours from the Amazon below! If you don’t have a fine-mesh strainer in your kitchen (like me) , use a coffee filter. It does a great job of holding the quinoa while that nasty bitter-tasting stuff goes down the drain and leaves the good tasting seed for you to enjoy! Be sure and use a clean, dry filter. Fortunately the quinoa doesn’t leave a residue, unlike those pesky coffee grounds. Do You Rinse Quinoa Before Cooking It? If so, let us know your methods and we will be happy to pass them on to our readers. We always love learning new ideas and techniques for useful kitchen hacks. Be sure and check out our other Platter Talk Kitchen Tips! Who knows what you may learn to make your life in the kitchen just a little easier and less complicated. I forgot to rinse bulk quinoa for a bread recipe but toasted and ground it to a fine flour . The 4 ounces of quinoa was added to the recipe along with 5 ounces of potato 5 ounces of sorghum and 5 of gabanzo flours .When baked I didnt detect a bitter taste. Baking may alter the compound that causes the bitterness in quinoa; I’m not sure. Also, the other ingredients in your bread may have countered any bitter flavor that would have been there and finally, some quinoa is pre-rinsed. I didn’t have a fine mesh strainer so I googled to see what I could use and this was the first thing that came up! I wouldn’t have thought of this on my own so thank you!! So happy you found found this too, Beth. Please don’t be a stranger to Platter Talk! Such a great idea!! Thanks for sharing, I will definitely be trying this one out! Oh fantastic! Love this…and thanks for the coffee filter/strainer idea..totally doing this! Wow, thanks for such a great advice! I love quinoa! Thanks for the tips! I don’t use quinoa but I feel I should give it a go now. I didn’t realize it was so important to give quinoa a good rise and what a genius way to do it! Thanks for sharing! I eat a ton of quinoa and I always rinse it before I use it. I never thought of using a coffee filter. That’s a great hack if you don’t have a strainer. Thanks for the awesome tips! Such a great tip (and good reminder!). Love the coffee strainer idea as well! Using a coffee strainer is genius! Those little guys are so hard to rinse. I love quinoa and this is always a problem for me! Thanks for the clever solution. Thanks for linking up at #SaucySaturdays. Thanks for the nice comments, Christine. I hope you enjoy this food flash for rinsing quinoa! Thanks for the comments, it’s good to know there is pre-rinsed quinoa available as well! Where is the pre-rinsed available? Check with your local grocery store or maybe look on line. Excellent tip, Dan! This is great for all those cooks without fine mesh strainers. I think I have at least 5 fine mesh stainers varying in size. LOVE this easy method! Thanks for sharing! This is genius!!! I always end up getting quinoa all over my sink when I rinse it. Can’t wait to try this! It’s great to here from you and I’m happy that you can benefit from this idea! Thanks for the comments!! We actually use saponin (in powder form) in some of my experiments in lab! So yes, rinse rinse rinse that quinoa!